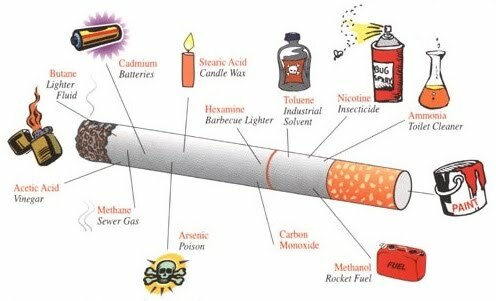 A cigarette is a disposable smoke delivery device consisting of a small (generally less than 10cm in length and 10mm in diameter) cylinder of cured and shredded tobacco leaves (or in some cases other herbs), wrapped in paper, which is ignited and let smolder for the purpose of inhaling its smoke. A cigarette is distinguished from a cigar by its small size and paper wrapping (cigars are composed entirely of tobacco); a small, cigarette-sized cigar is called a "cigarillo".Some cigarette smokers roll their own cigarettes by wrapping loose cured tobacco in paper; most, however, purchase machine-made commercially available brands, generally sold in small cardboard packages of 20 cigarettes. Commercial cigarettes usually contain a cellulose acetate or cotton filter through which the smoker inhales the cigarette's smoke; the filter serves to cool and somewhat clean the smoke.Before the Second World War many manufacturers gave away collectible cards, one in each packet of cigarettes. This practice was discontinued to save paper during the war, and was never generally reintroduced. On April 1, 1970 President Richard Nixon signed the Public Health Cigarette Smoking Act into law banning cigarette television advertisements in the United States starting on January 1, 1971. Tobacco use, notably in cigarettes, is one of the leading forms of preventable death. Smoking during pregnancy increases the risk of miscarriage and underweight infants. Smoking increases the chance of heart attacks and a variety of cancers. It also accelerates the aging process, and may cause premature aging. Therefore, smokers age faster than non-smokers.Smoking increases the metabolic rate, and thus can slightly reduce a smoker's weight.Nicotine is quite an effective appetite suppressant, and former smokers often develop junk food habits as they attempt to satisfy their tobacco cravings with snacks. It is not true that Smoking cessation is usually associated with weight gain, in fact, statistics show that only about one-third of those who stop smoking do experience a weight gain.